One Voice re-aired August 2014. 2,000 students sing in the Hawaiian language using four part harmony in a song contest. Joshua "Baba" Tavares, class of 2008 boys' competition director. One Voice tells the story of the Kamehameha Schools Song Contest through the eyes of the student song directors as they prepare to compete in a celebration of the revitalization of the Hawaiian language. Through the stories and the lives of these contemporary high school students, viewers experience Hawaiian culture as it has survived, flourished and grown through the universal power of music and song. Every year in Hawaii, 2,000 high school students compete in the Kamehameha Schools Song Contest, where young leaders direct their peers in singing Hawaiian music in four-part harmony. The contest is a unique cultural celebration that has become a major local event broadcast live on TV and on the radio and streamed on the Internet. One Voice shares the thrill of the competition and celebrates a culture as it has survived and flourished through the power of music and song. The melodies of a cappella choral music performed in harmony by thousands of high school students is a one-of-a-kind presentation of Hawaiian music. Kamehameha Schools is a statewide educational system for Native Hawaiian children of pure or part native ancestry that was founded in 1887 and endowed by the legacy of Princess Bernice Pauahi Bishop, a direct descendant of Kamehameha the Great. In 1888, the use of the Hawaiian language was prohibited at Kamehameha Schools. Subsequently, Hawaiian language was banned from Hawaii’s public schools through "English-only" legislation enforced in 1896. Just over 80 years later, in 1978, the Hawaiian language was made the official language of the State of Hawaii. 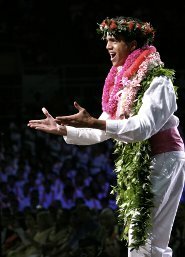 Today, there is a tremendous resurgence of the Hawaiian language, enabling the people to experience a deeper connection to their Hawaiian identity, culture and homeland, which is reflected in the fierce spirit of competition surrounding the song contest. The junior song directors await the reading of the song contest results. The annual competition involves tremendous amounts of preparation and rehearsal. As the film follows the elected student song directors — from the senior, junior, sophmore and freshman classes — it reveals how the tradition creates an indelible experience that builds class unity, instills cultural pride and builds character. The song contest is the most highly anticipated event of the year and the competition among the classes is intense. One Voice also explores the student song directors' life outside of school by profiling their families, or 'ohana, and revealing their hopes and dreams for the future. One Voice embodies the aloha spirit that is at the center of a dynamic and thriving Hawaiian society in the 21st century, while paying tribute to the long and glorious history of Hawaiian music and culture. For the students, it all culminates in one night of competition, when they sing with one voice. The film is a living, breathing and singing celebration of the Hawaiian people. One Voice was produced by Heather Haunani Giugni and Ruth Bolan and directed by Lisette Marie Flanary. © Pacific Islanders in Communications. All Rights Reserved. Text and photos courtesy of Pacific Islanders in Communications.